She’s in Ohio. If I write too slowly, she’ll be in Pennsylvania before I finish. Sixty miles a day will get you a long way in a hurry. From San Francisco’s City Hall, Sandra Villines has now traversed California, Nevada, Utah, Colorado, Nebraska, Iowa, Illinois, and Ohio. That’s around 2,400 miles in 44 days. Ultra runners know what that costs in energy, strength, and mental toughness. Not to mention the nearly obsessive focus on calories, elimination and strictly positive affirmation. 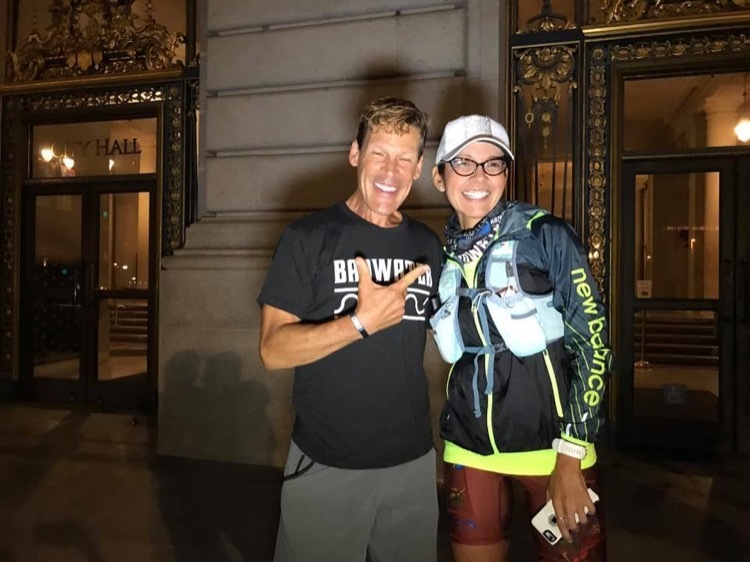 Sandy is joined by Dean Karnazes at her San Francisco start. 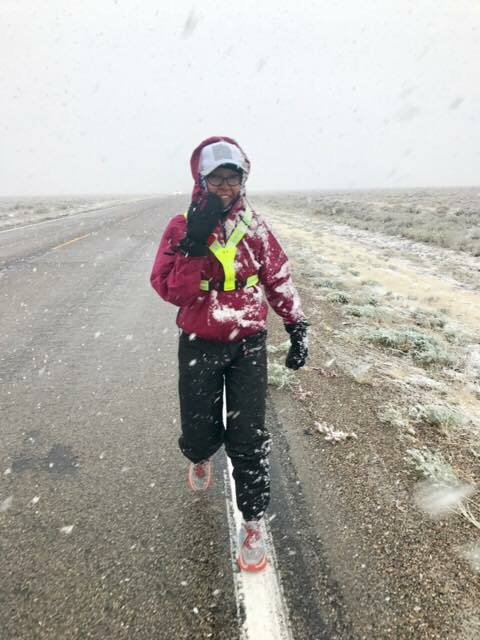 Sandy, the 2017 female Badwater champion, is not the first person to run across this vast continent, but she’s on track to shatter the former female speed record of 69 days set by Mavis Hutchinson of South Africa in 1978. If all goes well, Sandy will finish in 53-54 days, trotting into New York City just as 50,000 other runners descend for the New York City Marathon. Now that’s drama! Send the film crew! Actually, Sandy has been rather quietly running under the radar, all the way across America. Running is not particularly a spotlight sport, outside of the Olympics, and female running still less so. Maybe no one thought she would make it. Day by day, she’s busting that assumption. 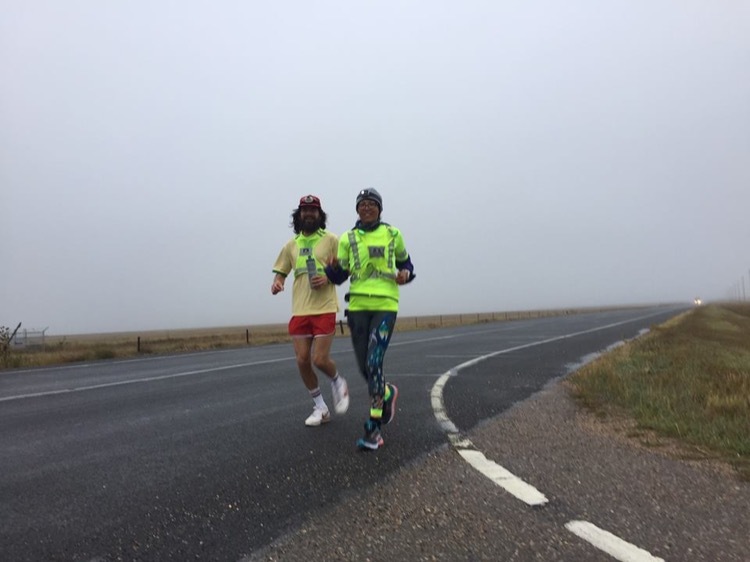 In the heartland, Nebraska and Iowa, Sandy received especially warm treatment, with curious onlookers pulling aside to give her the road with friendly waves, running home for care packages to take back out to the highway, and alerting local runners of the opportunity to go out and run with a legend-in-the-making. Sandy’s crew amassed all sorts of homemade treats and meat (it’s cattle country out there) for Sandy from the well-wishers. The kindness she encounters enroute often brings tears, as her emotions are raw at this late point in the project. Sandy is joined by a high school cross country team in the heartland. At the end of each day of running, Sandy climbs up into her travelling house, the RV also used by Pete Kostelnick who set the men’s trans-con record last year. This rolling behemoth is piloted by Cinder Wolff who also functions as den mother, massage therapist, chef and germ warrior. Sandy’s immune system is weakened from the prolonged exertion, and Cinder carefully protects her environment from any potential source of illness. The nightly routine goes like this: shower, elevate legs (not at the same time), eat large meal of the day, massage á la Cinder, dessert, and in the sack by eight. Calories are pushed all day long, right up to bedtime. Sandy needs about 6,000 calories per day and many things don’t appeal anymore. Her favorite chips haven’t been touched since the first week. In this end game, Sandy is eating things like bread-n-butter, high-fat concoctions like avocado with mayonnaise, and the current favorite, the Salami Taco (flatbread with salami and mayo.) She has a shake three times a day and fills in the gaps with CarboPro, Huma gels, Rip van Wafels, bananas and applesauce. The crew has learned to push sweets like Gummi Bears and Swedish Fish when Sandy’s emotions overtake her, to elevate her blood sugar. The one constant has been Coca-Cola, which has tasted good from day one and is now her nutritional security blanket. Constant effort to keep calories flowing. Her enroute crew man is Jay Lee, who supports her in the “Clown Car” (a Toyota Yaris). Jay is now stopping to crew her every half-mile or so, with just a sip or a bite of something at each stop. Since they shortened the interval of crew stops, Sandy has been able to pick up her pace from 50 miles a day to 60. From the beginning of the planning for “Sandy Across America,” safety has been a paramount concern. The runner is on highway, and must be suited up for high visibility, with excruciating consciousness of traffic. This responsibility, of course, falls on Jay because Sandy’s job is simply eat-run-eat-run. In the heartland states, motorists kindly exaggerated their awareness of her, moving completely out of her lane to give her clearance. Since leaving the heartland, however, she’s encountered much less friendly traffic, even some drivers who deliberately brush too close. Just a few months ago, a New Zealand man running across the country for charity was struck by a pickup truck in Ohio. Nick Ashill is recovering in a Columbus, Ohio hospital after having his legs shattered by the driver who deliberately swerved onto the shoulder of the road and drove off without stopping. Sandy is running considerably north of Route 40, where Ashill was struck, but such things can happen anywhere, and Sandy’s crew is vigilant. Pete’s memory shows that the elementary focus required of the runner, which makes abstract thinking difficult on the road, does not entirely crowd out impressions and details. At this point in Sandy’s run, she can only respond to the most basic questions. She has no idea what is going on in the world besides her one foot in front of the other, and probably couldn’t absorb it if she tried. 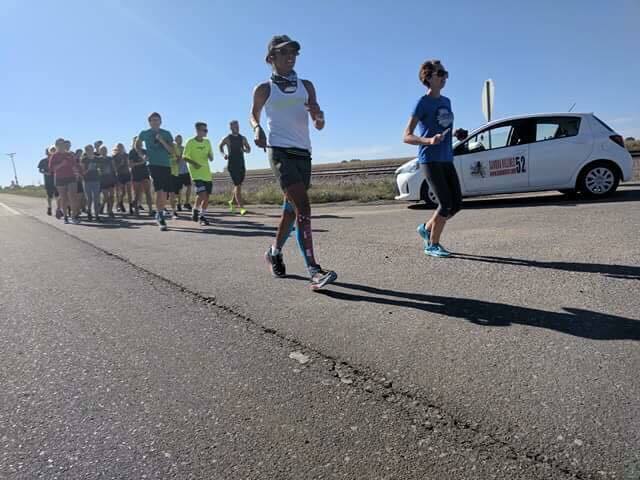 When asked for a quote, Sandy was able to offer, “There’s a lot of corn in America,” and “Jay gets in and out of the Clown Car 110 times a day.” Such things occupy the mind of the Running-Eating Machine that Sandy has become for the duration. Sandy’s coach, Dave Krupski, joins her on the road. 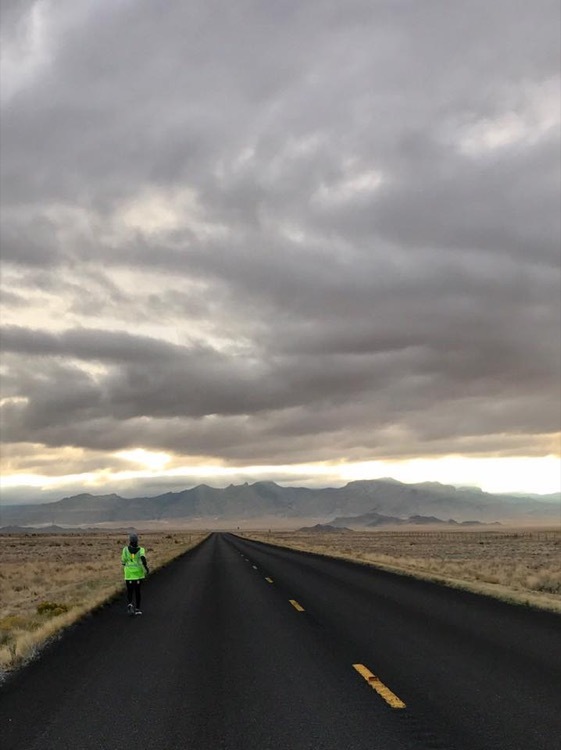 From within her ‘bubble,” Sandy is not aware that Mimi Anderson, the British runner who started out on her own record-challenging run across America just a few days in front of Sandy, has had to drop. A past meniscus tear had worsened for Mimi, and she opted to abandon the record attempt before incurring permanent damage to her knee. Sandy is blissfully unhindered by any serious overuse injury. Apart from minor tendinitis, her biggest concern has been a developing carpal tunnel effect from carrying “The Baby,” her live-tracking GPS device. It seems that her body is well-designed to adapt to such immense distances; most of us would have reported to sick bay at least a thousand miles ago. Encountering early snow in Utah. The best guess of the crew at this point is that Sandy will arrive in New York somewhere around November 3-4, just before the Marathon on November 5. Sandy is an unassuming, modest person without any specific desire to make history, but her accomplishment will boost every female athlete, every young woman who dreams of doing something that sounds crazy to others. Given one more week of freedom from injury, Sandy will mount the steps of New York’s City Hall, and probably burst into a storm of tears, given her raw emotional state. And she won’t be alone. She will have accomplished an act of great courage, strength and personal character, of which all America may be touchingly proud. One woman, a vast continent. Sandy’s crew opened a GoFundMe campaign when it became apparent that sponsorships would be smallish. You can boost her by visiting https://www.gofundme.com/sandy-runs-america. Sheryl Collmer runs and writes in Plano, Texas. Photos were taken by Sandy’s crew. Just waaay beyond “awesome”! Go Sandy go! Yay Sandra!! I can tell you she is totally rocking it as I’ve been lucky enough to join the crew for the last 700 miles! So amazing to witness this!! GO SANDY!!!! Cheering you on from your friends in Tracy California! GET IT GIRL!!! Sandra will be finishing this trans com dream tomorrow!! Please get the press; TV and radio out there to witness history being made!! She deserves the spotlight for something of this magnitude!! News is usually negative and more unpleasant stories then pleasant!! PLEASE GIVE SANDRA SOME PRESS TIME THAT SHE HAS EARNED!! Please and thank you NY! !